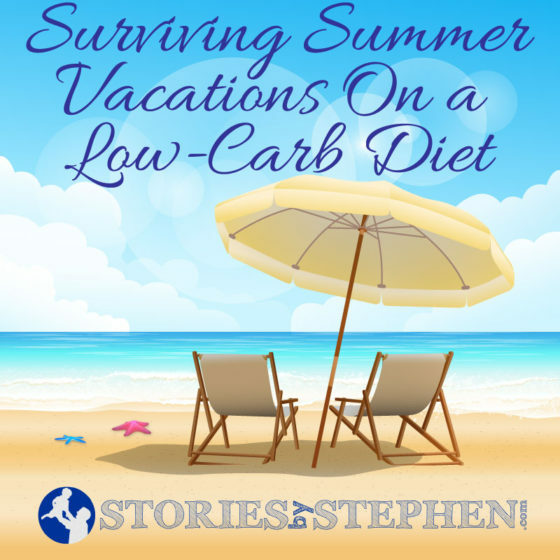 I have been following the “Primal Diet” (low-carb high-fat diet) for about 3 months now, and I strategically began the diet several weeks before a series of summer trips, knowing that these trips would be like running the gauntlet of sugary temptation. My prediction was correct about the difficulty of eating healthy during a several week stretch of summer where routines and normal eating would be thrown out the window. Click here to read about my initial experience with the Primal Diet. The especially difficult period was about 4 weeks long, and it included the following: a trip to my parents’ house in Memphis for 6 days (where fresh baked cookies and brownies are a daily occurrence), 4 nights of VBS (where I was at church volunteering during the time where I would normally run and cook my own healthy dinner), 8 days at the beach (including several meals at nice seafood restaurants), and 3 days at a family reunion at Joe Wheeler State Park (Alabama). These trips/special activities were all back-to-back-to-back, with no more than a couple days in between (and sometimes less than a day in between). At Joe Wheeler State Park in Alabama for the Smith Family Reunion (my mom’s family). 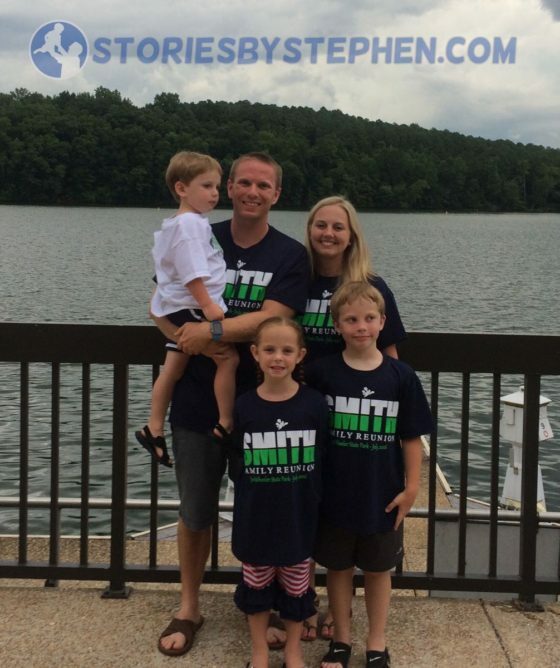 With many of my cousins and their families at the Smith Family Reunion. My personal key to nutritional success depends on me preparing and cooking all my own meals. Since I have been acclimating to a LCHF (low-carb/high-fat) diet, I have discovered that most of the time it is really not that difficult to eat healthy these days, as long as I am in control of my own food. At home I have a fridge full of all the veggies I like, along with my personal cooking oils (butter, bacon grease, coconut oil, red palm oil, extra-virgin olive oil) and spices. I have figured out how to get various types of delicious flavors depending on what taste I want. For example, if Jennifer and the kids are eating tacos, I will cook vegetables with a Mexican flavor and add in the taco meat, basically making a beef taco stir-fry. I can do the same thing for Italian and Chinese meals, and one of my staple meals is simply a giant pan of sautéed veggies with rotisserie chicken mixed in. I eat vegetables at breakfast, lunch and dinner most days, and I keep them both delicious and healthy by using the right cooking oils. At home it is usually easy to not eat bread, pasta, chips or tortillas because I have found that my meals now taste just as good if not better without loading up on empty carbs. The problem is that eating healthy can be very time consuming in today’s fast-paced society. Except for salads a couple days a week, I do not eat many raw vegetables right now, but cooking every meal really slows things down and “eats” up my day. Since I am a stay-at-home dad, this is usually fine because I have am already at home and have access to all my own food and cooking stuff. However, eating healthy can get very complicated when traveling, especially when I am the only person on a big family vacation who is trying to eat a LCHF diet. It is not only difficult to eat a healthy diet during a series of family vacations, but it is also really hard to maintain a regular workout routine. This double-whammy can get you off-track very quickly from a healthy lifestyle. I discovered this firsthand last summer when I gained 20 lbs in a month because of terrible eating habits and very few workouts during a several week stretch while we were both going on a beach vacation and moving from Indiana to Alabama. That extra 20 lbs of fat has plagued me for the last year, so I was determined not to let it happen again this year! The biggest challenge to healthy eating during vacation (or week-long special events at church) is simply the fact that my regular routine is broken. I get used to cooking my meals and eating them at a certain time each day, but when my routine is gone, it is easy to just eat whatever is quick and available. The next challenge is that I am not always in control of my own meals when I am on vacation. At my parents’ house and at the condo where we stay at the beach, I at least have access to a full kitchen, so I CAN cook my own meals. But just because I can does not mean it is convenient, or that it fits into the rest of the family’s schedule that day. On our big family beach trip to Perdido Key, FL each year with Jennifer’s mom, stepdad and brothers’ families, we eat out several times at seafood restaurants. When you eat out at restaurants, whether local or during vacation, you largely lose control over what you ingest. I was really disappointed to find that 99% of side items at every single restaurant were just various forms of empty carbs. We were not eating at fast food restaurants either, but even at nice seafood restaurants they have virtually no vegetables on the menu. I guess they serve what the majority of people eat, so their menus are full of SAD (standard American diet) eating choices, making it virtually impossible to stick to my low-carb/high-fat diet. The Primal Diet is not a low-calorie diet, and it is the opposite of a low-fat diet. It is mainly a low-carb diet where eating real, healthy food is a priority. Even restaurants with “diet” options on their menus are offering items that are either low-calorie or low-fat, but the Primal Diet is not so much a “diet” in the popular use of the word. It is not a fad-diet or a short-term way to drop pounds (that will inevitably come back once you revert back to your SAD ways, but it is a long-term lifestyle change where you cut processed junk and empty carbs and get back to eating natural foods. What restaurants do not offer is a section called “low-carb/high-fat” on their menus. This leaves me with a couple options when I eat out with family on vacation. I can just eat meat and skip all the carbs on my plate. This option is ok on some level, but as much as I need plenty of protein in my diet, I do not need to eat ONLY protein. The next option is to either fast during the meal (what fun is that?!?) and cook my own dinner later that night, or to eat just protein at the restaurant and cook up some veggies later. Cooking dinner later at the condo is extremely inconvenient, and who really wants to sit through a nice dinner with family and not eat? The final option is to just forget the Primal Diet and eat whatever sounds good at the restaurant. This is fine to do sometimes since most people try to follow an 80-20 rule on the Primal Diet: eat healthy 80% of the time and allow special treats and processed carbs the other 20% of the time. I would love to just eat healthy 100% of the time, but sometimes it just is not worth the battle and the stress. Family vacation is a time of fun and relaxation, so I tried not to stress myself out over food too much. Last year on vacation I ate everything in sight. I drank Coke constantly, snacked on Fudge Rounds and Oreos all day and at all the bread, chips and crackers that were put in front of me. This year during our various summer trips, I allowed myself to eat whatever I wanted for brief periods… candy and popcorn at the movies, hushpuppies and warm bread at restaurants, ice cream or brownies some nights. But I did not allow myself to just indulge in junk food all day, every day. I tried to still cook veggies and eggs for breakfast or lunch and snack mostly on nuts, fruits and veggies. Before every trip we took this summer I spent a couple hours cooking vegetables I could carry in Ziploc bags to eat as snacks on vacation. 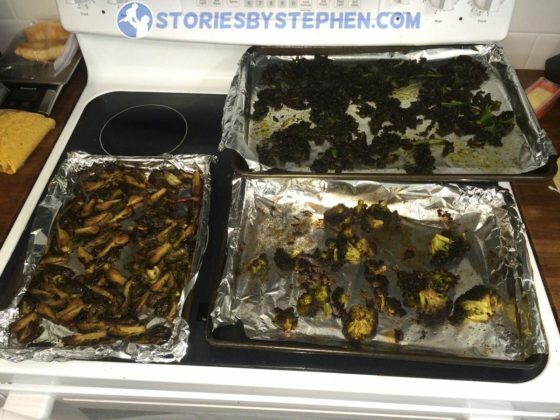 These are my 3 favorite veggie snacks: brussels sprouts baked with olive oil, broccoli baked with olive oil and kale chips baked with red palm oil. When we did not eat out at restaurants, I cooked my own healthy dinners, but when we did eat at restaurants, I ate whatever I wanted. I did not run my normal 35-50 miles per week, but I tried to at least run about 20-25 miles per week during all these vacations. I knew that this would be a month where I do not lose any weight or advance any in my fitness, but my goal was simply to not gain too much weight or lose too much fitness. If I could come out about even, or just in slightly worse shape, I would count that as very successful for the most tempting time of the year (besides Christmas) to just let myself go. Last summer during this season my weight went up from 165 lbs to 185 lbs. When I started the Primal Diet in mid-April of this year, I lost 10 lbs the 1st month. Then I lost 5 lbs in month 2. The 1st couple weeks of summer I got my weight back under 170 lbs for the 1st time in a year. I would say that my average weight in June was about 168 lbs, as it basically would go back and forth within the 165-170 range. Going into vacation season my goal was not to let my weight go up more than about 5 lbs. I carried a scale with me to the beach and weighed daily. If I got back up to 175, I would quickly halt the extra sweets and carbs, but if I just stayed around 168-173, I would not stress about it. What I found was a weird weight pattern. Both during the week at my parents’ house and during our week at the beach, I saw the same pattern with my weight. On both of these trips I was very cautious at the beginning of the week, and I actually lost weight the 1st 3 days each trip. This happened because we did not eat out at restaurants the 1st few days during both trips, and I both cooked my own meals and ran everyday to start off these trips. Both in Memphis and at the beach, my weight went down to 165 lbs by the 3rd day of the trip. Then because I was doing such a good job, I loosened up a little bit and got a little lazy with my workouts. When I took several days off from running and ate high-carb dinners at restaurants several times, my weight quickly went up to 170+ lbs. Both of these trips I came home around 172 lbs, still 13 lbs below my weight 3 months ago. It felt good to let myself enjoy special treats on vacation without gaining a ton of weight, and it really showed that moderation is key. It also showed how quickly my weight can skyrocket when I eat unhealthy and stop working out. Twice in a month I saw my weight go up 5-7 lbs in just 5 days of unhealthy living! This is fine for a few days, but it reminded me that if I ate like that all the time again then I would have little hope of maintaining a healthy weight for the long-haul. I am confident that as we settle back into a more normal routine at home, especially with school starting back in 3 weeks, my diet, exercise and weight will get back on track and normalize. At least this time I am not starting with 20 lbs of extra weight! I usually get on a really strong, consistent workout schedule in the fall, and this year with consistently healthy eating I think I can keep dropping fat and hopefully get below 160 lbs for the 1st time since Jennifer and I got married 9 years ago. I am really pleased that I survived the summer gauntlet and am still in a positive position to meet my weight and health goals for the year. 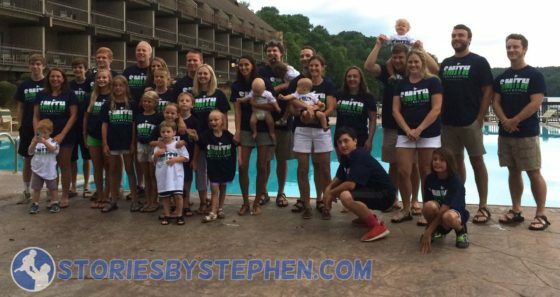 Click here to read about all our summer 2016 family adventures.